Ian Witt walks 15 miles a week, turning local streets into trails. But a special cause inspired him to hike 2,189 miles longer. Next week, starting in West Virginia, he plans a trek to Maine, and then fly back and hike to Georgia. He will use the Appalachian Trail Guide as his map and hopes he can accomplish the adventure within six months. Witt has dedicated the hike to raise money for the Haven Project. The Lynn nonprofit helps teens find homes. Executive Director Gini Mazman is grateful for Witt’s help. To make the journey, Witt quit his job at Slade Gorton, a Boston-based seafood products distributor and manufacturer, where he has worked since 2007 as a credit manager. 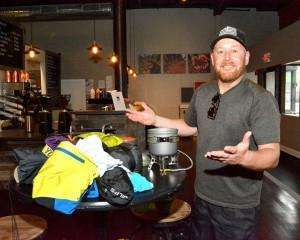 Witt plans to carry a 40-pound backpack filled with necessities, including a fold-up hammock, dehydrated food such as pasta, oatmeal and powdered milk, small bowls, a smaller fold-away gas heater, a six-inch metal shovel and clothes. He will also bring his cell phone and a battery charger. Witt expects to leave the trail occasionally to buy food and charge his devices. Witt will depend on a state-of-the-art filter system attached to a bottle in his backpack. The device looks like a large flexible straw. “I can put dirty water through that system and instantly drink clean water through the straw,” he said. Witt plans to use baby wipes as his daily clean up routine. He’ll bring a bar of soap along, in case he’s lucky enough to find a clean creek. As the departure day draws near, Witt said he is sad about leaving loved ones behind. He said that his mom, Chris Witt, who lives inSwampscott, was shocked when he first told her about his adventure. But she has come to terms with it and is happy for him, Witt said. He hopes to be back home to celebrate his girlfriend’s birthday in November. Trisha Gomez, his girlfriend of seven years, said she hopes they will talk regularly while he is on the voyage. She acknowledged that she is ambivalent as Witt prepares to leave.